Former Prime Minister Malcolm Fraser has launched the book “From Nothing to Zero” at the Old Melbourne Immigration museum on 6 May 2003. We spoke with the launch organisers from The Lonely Planet, just when they returned from the launch. When we scanned the news during the 24 hours following the launch, we had to discover, that apart from The Herald Sun, none of the print media bothered to cover the event. The Herald Sun told its readers that Fraser had talked about Australia's relationship with the USA, but we had to find the South African News service News24.com to learn that Fraser had actually also talked about Australia's asylum seeker policies. 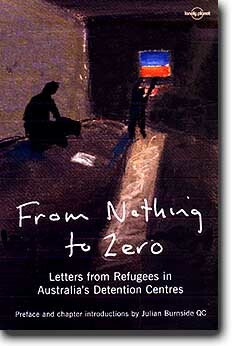 6 May 2003: 'From Nothing to Zero': Letters from Detention - "These extracts from letters from asylum seekers will help Australians see the refugees' many human problems. They have their hopes, their fears and their concerns for the future, as we all do. Their stories should create an understanding that people from different countries, different cultures and different religions have very similar concerns and interests to ourselves." Melbourne - Former conservative prime minister Malcolm Fraser lashed out on Tuesday at Australia's immigration policy, saying it contained a "significant element of racism". At the launch of a book about asylum seekers in detention centres, he said the government's policy of mandatory detention for all illegal immigrants was "very wrong", but unlikely to be changed. Fraser, who led a Liberal-National coalition government from 1975-83, also likened mandatory detention to the unlamented "White Australia" policy under which non-whites were banned as migrants up to the 1960s. "Evil may be too strong a word to use in relation to them, but the way the policy is carried out denies basic rights of asylum seekers," he told reporters here. Fraser, whose ministry in the early 80s included current Prime Minister John Howard, has become one of the Howard government's most persistent critics on either side of politics. He also attacked Howard's close relationship with the United States, claiming it was highly dangerous. Fraser said he understood the need for Australia to have a close alliance with the United States. "But to make the United States the be all and end all of Australian policy is highly dangerous for the long-term future of this country," he added. His latest barrage came as Howard ended a visit to the United States in which he was a guest at President George W Bush's Texas ranch and during which Howard declared the US-Australia alliance the strongest it has ever been. But he reserved his most stinging criticism for mandatory detention which he said was contrary to international conventions to which Australia had committed itself as far back as 1954. "I think there's a significant element of racism in the policy," he said. He told how he had come to hate any element of racism or sectarianism, saying that wherever they occurred in the world they had to be opposed. But he said the opposition Labour Party was no better, as it began Australia's current immigration policy and opened the immigration detention centres, which he described as "desert prisons". "I don't see any sign that either the government or the Labor Party would change the policy in ways that I would regard as adequate and significant," he said. He said many people would have believed there was no chance of overturning the White Australia policy after it was defended by former conservative Prime Minister Robert Menzies in 1949. But like that policy, he was hopeful that Australia's mandatory detention policy would also be overturned eventually. AUSTRALIA'S relationship with the United States was highly dangerous, former prime minister Malcolm Fraser said yesterday. "Obviously, in Australian politics there is a Howard ascendancy . . . just as in America there is a George W. Bush ascendancy," he said. "We should be pursuing independent policies. "That doesn't mean we don't have a close alliance with the United States. "But to make the United States the be all and end all of Australian policy is highly dangerous for the long-term future of this country." Mr Fraser was speaking at the launch of Nothing to Zero, a collection of letters written by asylum-seekers to Australian human rights campaigners. The title is a breakaway from Lonely Planet's usual fare as the world's largest publisher of travel books. It originated from a letter-writing program organised by the Spare Rooms For Refugees campaign, run by human rights advocate Julian Burnside, QC, and partner Kate Durham. Mr Burnside said it gave "a face to the faceless, and voice to the voiceless". In the book, detainees from Afghanistan, Iraq and Iran speak of their fears, thoughts about the future and hopes. One asylum-seeker wrote: "I've been rejected by immigration . . . I don't know why I am rejected by them. I have to face (a) big problem due to this rejection and I can't imagine what I am going to do." Mr Fraser, a former Care Australia chairman, launched the book at Melbourne's Immigration Museum. "The concept of this book is exciting, important . . . especially at a time when there's no adequate political debate on the plight of refugees in Australia," he said, emphasising that both sides of politics were guilty. Profits from the book will be donated to the Refugee and Immigration Legal Centre and the Asylum-Seeker Resource Centre.